"We're called Tropic Harbour, which is appropriately named for this weather." Playing outside when winter starts to threaten in Edmonton can be a daunting task. Yet locally based dream-pop band Tropic Harbour enthusiastically warmed up the small but appreciative crowd in a quaint downtown park. 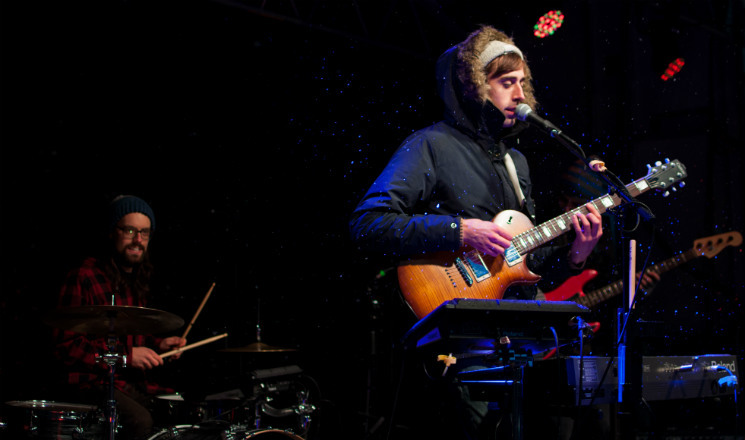 Clad in toques and winter jackets, the quartet were cheery and buoyant playing their sun-soaked tunes, despite the wet, blowing snow. Led by Mark Berg, Tropic Harbour soothed with their blend of glistening keyboards and bright, hooky guitar riffs — textures reminiscent of bands like Wild Nothing or Tycho. While Berg's voice doesn't waver much from a tender, melancholy tone, it fits well with the band's bedroom-pop sensibilities. Much of the set was devoted to the danceable tracks on their forthcoming debut LP, Glowing Eyes, which showcased Tropic Harbour's affinity towards fluid arrangements and luminous melodies. The four-piece battled through the cold — Berg's synthesizer became victim to the weather and stopped working halfway through the set — but were met with a grateful applause. The show ended with a one-line zinger from Berg that brought whole new meaning to "chillwave," as he deadpanned, "We have tank-tops for sale."